Currently, almost all space devices get energy from solar batteries, even though their massive size creates many problems. Russian scientists are developing a method to recharge electric drones in the air by transferring energy via a laser beam. The technology can also be used in outer space to recharge satellites. Blasters and laser canons look stunning in the epic battles of "Star Wars,'' but in reality a laser weapon is extremely ineffective and an ordinary mirror can provide almost 100 percent protection from such blasts. However, there is demand for lasers in certain economic sectors. For example, lasers transfer information over optical networks. Now, scientists at Energia Rocket and Space Corporation headquartered in the Moscow Region have devised another purpose for lasers. They propose recharging electric drones in mid-air and transferring energy via a laser beam. The drone market is growing rapidly, and in 2015 global sales reached $5 billion. "Our technology can allow drones to function around-the-clock," said Russian engineer Ivan Matsak, one of the new technology's creators. Matsak long believed it was senseless to transfer energy with the help of lasers because their efficiency constituted only a small percent, not even taking into account the losses experienced while transferring and transforming energy. In the 2000s the situation began to change with the appearance of infrared lasers with an efficiency level of 40 to 50 percent, as well as with highly effective photo-electric modules capable of transforming 40 percent, and in some cases 70 percent, of radiation energy into electricity. This motivated scientists to seriously consider using laser lines in electricity transfer. Such a line must consist of an effective infrared laser, a focusing and targeting system, a photo-detector aboard the drone, and a battery just in case the line is disrupted. Actually, the targeting system already exists. These are highly effective photo-electrical modules developed by the Ioffe Physics and Technology Institute. The effectiveness of transferring energy in such a system is about 10 percent, which means that with a power capacity of 200 Watts it can maintain the drone at a height of one kilometer for a long period of time. Scientists, however, have decided to go even further and plan to use laser technology for electricity transfer in space. There, the technology will be even more effective because nothing absorbs radiation in a vacuum. Currently, almost all space devices get energy from solar batteries, even though their massive size creates many problems. In outer space, the large and sophisticated solar batteries must constantly face the sun. Laser supplies of energy, however, will help prolong the lifetime of micro-satellites at any time and location. Experimenting in space is another problem that can be solved with energy supplied by laser lines. For example, the International Space Station (ISS) does not have stable zero gravity. It vibrates, oscillates and experiences micro-acceleration due to the various devices functioning in it, such as the engines rotating the solar batteries. This prevents the successful conclusion of many experiments, for example, those involving the growth of crystals. The laser transference of energy can help create ideal conditions for such experiments on board autonomous technological modules. 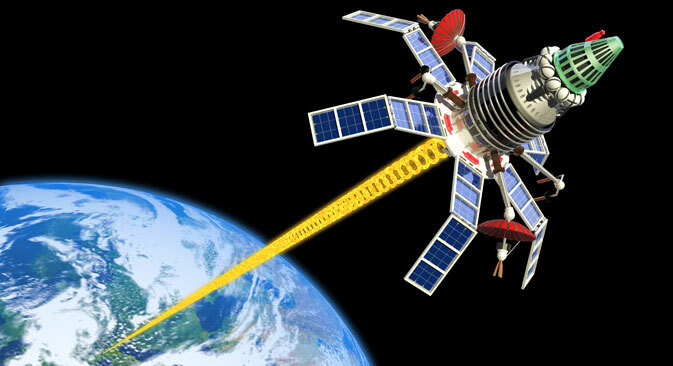 Russian scientists believe that lasers can also help recharge the space transport system. They have long been considering the idea of inter-orbital tugboats to move satellites to higher orbits. Matsak and his colleagues have developed a plan for a space experiment called Pelican, to be conducted in 2017. It's supposed to transfer energy from the Russian segment of the ISS to the Progress cargo spaceship. For now, scientists are preparing a land-based experiment that will transfer energy at a distance of about one kilometer.